To boldly go where no Irish artist has gone before… or have they? A good friend [Dubliner Mick Cassidy, currently a character designer for Family Guy] has been selected to showcase his talents at the Star Trek, 50 Artists, 50 Years exhibition in the US, and I thought it deserved a bit of recognition this side of the Atlantic. Posted in Misc and tagged Star Trek at 4:59 pm on July 20, 2016 by Broadsheet. First Panel, second row is The Cage/The Menagerie, fourth panel on the same row is The City on the Edge of Forever. 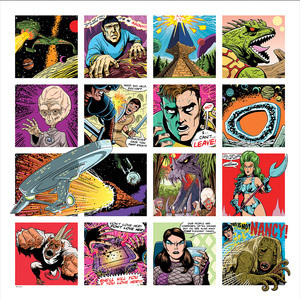 The double-wide panel on the third row is The Doomday Machine, I think the second one is The Apple, and the last panel there is The Gamesters of Triskelion. On the last row the third is The Enterprise incident.